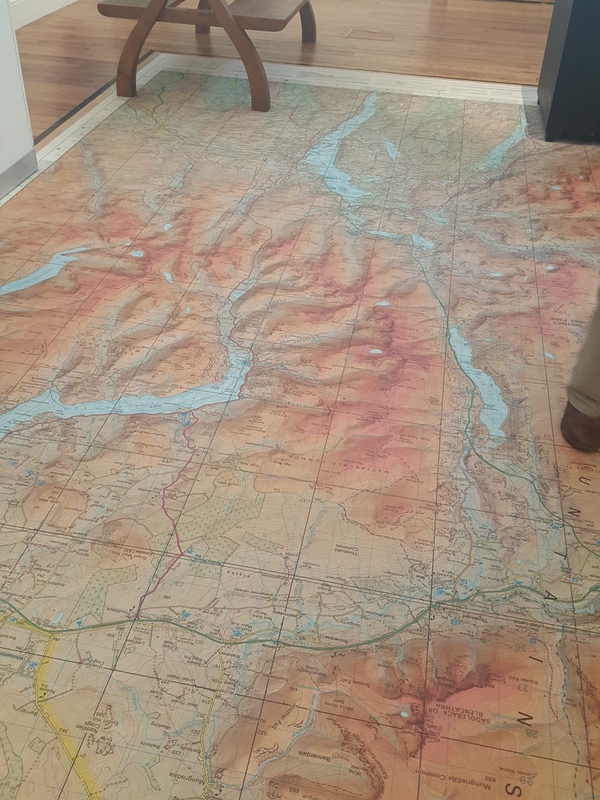 This floor graphic was used to display a topo map of the hiking in the Lakes District of England, where I spent a week this summer. I thought it was a pretty cool way to display the map, and it received a lot of compliments from the people at the exhibit. We print floor graphics from time to time, and we keep the material in stock. It’s a heavy, adhesive backed vinyl with a tough, non-slip overlaminate. While we didn’t produce this map, we certainly could have done it. It was printed in 1 meter wide strips, this being Europe. We get the material in 48″ widths, so we would do a job like this in 45″ or so strips, with an inch of overlap. Typically the installer would do a double cut like they do on wallpaper so that the joint between strips matches perfectly. This entry was posted in large format printing and tagged floor graphics, floor maps, museum graphics, topo map printing. Bookmark the permalink.